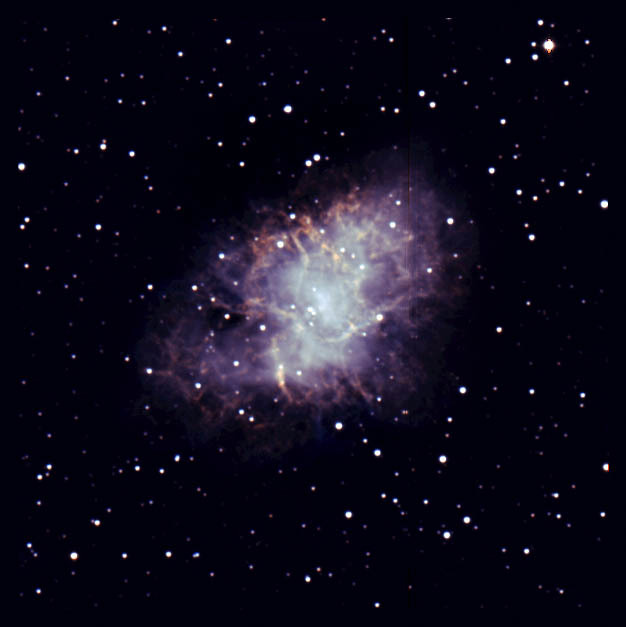 Polamar Skies - Astrophoto Friday - Crab Nebula | Astro What? It is nearly Independence Day here in the States. That is traditionally a time for fireworks. It also seems to be a tradition of mine to post a Palomar photo of the Crab Nebula which was created by one of nature's biggest fireworks displays - the collapse and explosion of a massive star (See my post from 2009 and 2010). The supernova explosion that produced what is now known as the Crab Nebula was first observed on July 4, 1054 A.D. - 722 years before the American Declaration of Independence. This image of the Crab Nebula was captured using the wide-angle 48-inch Samuel Oschin Schmidt Telescope. This is a crop of a much larger image. It was taken as a part of the Palomar Transient Factory (PTF) survey and comes to us from Jason Surace and the PTF collaboration.